Did you know July 31 is Harry Potter's birthday? Did you know there is a new book Harry Potter and The Cursed Child, that was released the same day? Abbey and I went to a Harry Potter Release party Saturday night. 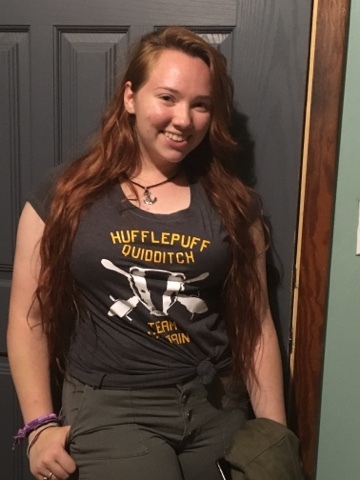 She had to wear a shirt announcing to the world what house she was sorted in to. I kept saying I felt like I was Slytherin, I had never officially been sorted, so Abbey sent me the link and I officially got sorted and surprise, surprise, I am Slytherin. We are major Harry Potter nerds. Actually we are just big nerds and Harry Potter is just one of our outlets. I've read all the books, watched all the movies, and just couldn't wait for the new book to come out. Have you watched Harry Potter or read the books? What house are you in?